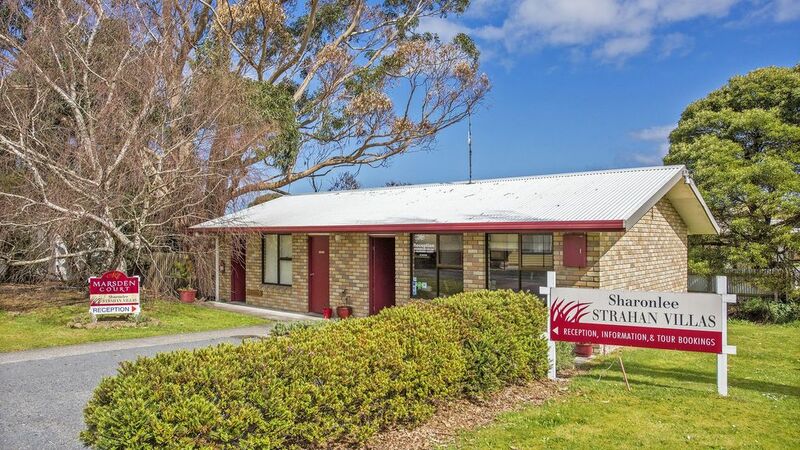 Sharonlee Strahan Villas offer comfortable and spacious 1 and 2 bedroom self contained accommodation. All villas have kitchen facilities and can accommodate from 1 to 4 persons in most of the villas although there is 1 larger villa that can accommodate larger families of 5 and 6 persons. All villas are ground floor with carports and plenty of parking. A well equipped communal laundry is available for guests to use. Free WiFi is also available along with portable gas BBQ's and DVD hire. Most people visit Strahan to experience a Gordon River Cruise or enjoy a train journey on the ABT Railway, climb the Henty Dunes or watch a sunset over the water at Ocean Beach. There are rainforest walks and beaches to explore. You will need more than one night to fully appreciate this unique wilderness region. Couples or families, groups or individuals are welcome to stay at Sharonlee and enjoy the comforts of home whilst they explore this fascinating area. Staff at Sharonlee can arrange your accommodation and book your River cruises and train journey so your stay is complete. Sharonlee Villas is owned and operated by locals with local knowledge who are passionate about this special area and Sharonlee is an EarthCheck Assessed property. Bathroom has a walk in shower and vanity and the toilet is in a separate room. Free Wifi available in villa as well as an internet Kiosk in Reception area. and electric frypan and saucepans and pan. Monopoly, Trivia Pursuit. Scrabble. Chess, Draughts. Squatter and card games. We stayed here so as to go on the Gordon River trip. The cabin is basic but has had some more recent updates including a large screen tv and hotplates. The beds are ok and the kitchen reasonably provisioned with cutlery, crockery and utensils. The shower was hot and reception very friendly and helpful. The main attraction for us was that the cabin was perfectly cosy while a very windy and rainy storm raged outside all night. Older style accommodation a little dated but kept very clean. Everything you need in the room. Very friendly and helpful staff. Perfect place when just passing through the town for a short stop over. Gardens surrounding the buildings kept in great condition and beautiful. Thank you Julie for taking the time to review our property. We do love our gardens and pride ourselves in our cleanliness. We hope we may welcome you another time when visiting Strahan. Very friendly staff. Facilities were spacious but a bit dated.Located in the suberbs of Strahan. Fantastic little units - cosy and comfortable. PAM was the ultimate host. Thank you. The units have everything you need ... comfortable beds, great little kitchen & dinning area and nice hot water in the shower. We were very happy with all the amenities. Thank you for your lovely comments. It was great to meet you both and so pleased you enjoyed your stay. Regards Pam. Excellent accommodation, warm, and comfortable. Wonderful couple of nights stay. Bought friends from South Australia and they also enjoyed their stay. Thankyou!! Dear Sue, Thank you so much for your lovely comments and so pleased you and your friends enjoyed your stay in Strahan. We would love to welcome you back if ever you visit this way again. Kind Regards Pam. Dear Jenni, Thank you for your positive review and so pleased you enjoyed your stay. I trust you also enjoy the rest of your holiday touring Tasmania and if you ever come back this way we would love to welcome you again. Kind Regards Pam.